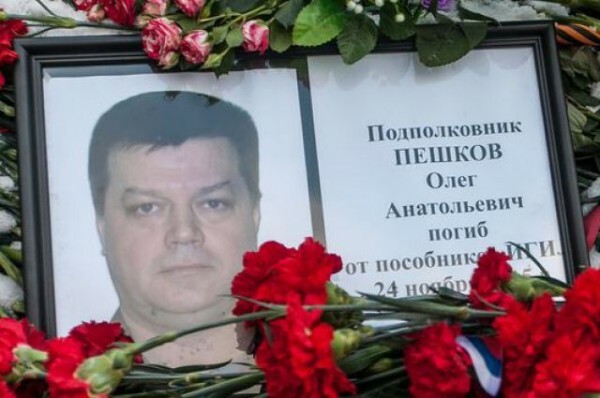 Lipetsk, December 3, Interfax - According to the police estimations, about 10,000 people attended the farewell ceremony with the Hero of Russia, the pilot of the bombardier jet Su-24 hit in Syria Oleg Peshkov, which was held on Wednesday in Lipetsk. After a requiem service in the Cathedral of the Nativity of Christ, the coffin with the hero’s body covered with the Russian flag was delivered to the regional center of culture and national art where a civil commemoration ceremony was held. Then the cortege drove to the Alley of Heroes in a city cemetery. Chief Commander of the Russian Air Space Forces Viktor Bondarev opened the commemoration meeting and noted that Peshkov was a wonderful person and a true officer and expressed his condolences to the pilot’s family. “Oleg Peshkov during all his life and service continued the affair of the previous generations of Russian soldiers who had helped countries and nations in trouble for centuries. Unfortunately, the good and heroism of Russian soldiers were met not with gratitude, but also with vileness. That is what happened on November 24 in the Syrian sky,” head of the region Oleg Korolyov said. The Hero of Russia was buried with the bursts of military salute.